The word volcano comes from the name of Vulcan, the ancient Roman god of fire. Volcanoes are vents in the ground where magma from inside the Earth forces its way to the surface and escapes in an eruption. There are about 1,510 active volcanoes in the world. 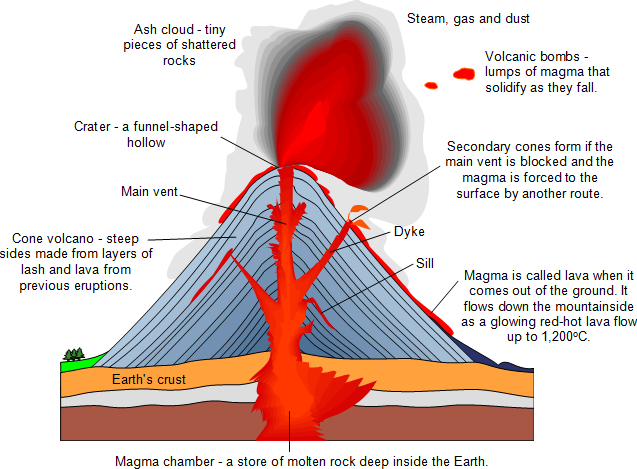 A typical volcano is a mound with a pipe, or vent, down the middle and a magma chamber below. Channels called sills and dykes may also lead from the magma chamber. When pressure builds up in the magma chamber, a mixture of magma and solid rock, called lava, pushes up the vent and the volcano erupts. If the lava is very thick it may set inside the vent and form a plug. Great pressure builds up and finally explodes the plug, hurling chunks of rock called volcanic bombs into the air. If lava is thin, it erupts much more gently. Each time a volcano erupts, the lava sets as a solid layer. As the layers build up, the volcano grows. Thick lava flows only a short way before setting so it forms steep-sided cone volcanoes. Thin lava flows further before it sets, so it forms volcanoes with gently sloping sides. These are called shield volcanoes. 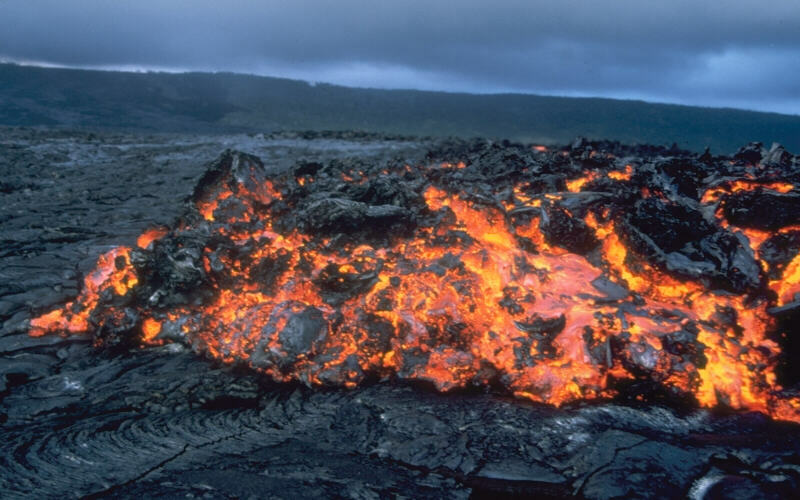 If underground water is close to the magma, it becomes extremely hot and may rise up and erupt. It may spurt out of the ground as a jet of super-heated water called a geyser or as a jet of steam called a fumarole. Mud pools form if steam bubbles through volcanic ash. Volcanoes that erupt regularly are called active volcanoes. Volcanoes that will never erupt again are extinct. A dormant volcano is one that hasn't erupted for over 2,000 years. Many volcanoes are under the sea. Some grow so big that they emerge above sea-level as new islands. Iceland is a volcanic island. It is still growing with each eruption. volcanic gases such as carbon dioxide and carbon monoxide being let out. people losing their possessions and being left homeless. Scientists who specialise in volcanoes are called volcanologists. They use monitors to detect movement in the rocks that make up the volcano and in the earth's crust. They also measure the gases that come out of the volcanic mountains, and even the angle of the slopes. Whilst it is easy to locate volcanoes, it can be very difficult to predict when exactly a big eruption will take place however. Methods include studying a volcano's history and looking for expanding cracks or swelling on its slopes as the magma reaches the surface. Once lava has started to flow, it may be possible to divert it away from settlements by: digging trenches, building barriers or by pouring cold water on it. Foreign aid will probably be needed to help with: the emergency response, food shortage and refugee crisis as people are made homeless. Despite the danger, many people still want to live near volcanoes because the soil is very fertile to farm on and visiting tourists spend lots of money in local businesses. In AD 79 the eruption of Mount Vesuvius destroyed the Roman cities of Pompeii and Herculaneum. Thousands of people are thought to have died and the remains of many people were preserved by the ash. Since then, it has erupted several times, most recently in 1944. In 1815 Mount Tambora in Indonesia killed around 92,000 people. It released so much ash into the air that it blocked out large amounts of sunlight. Temperatures around the world dropped for months afterwards, making 1816 a ‘year without a summer’. The 1980 eruption of Mount St. Helens, in the US state of Washington, was one of the biggest in North America. It killed an estimated 24,000 animals including 11,000 hares, 6,000 deer, 300 bobcats, 200 black bears and 15 mountain lions. 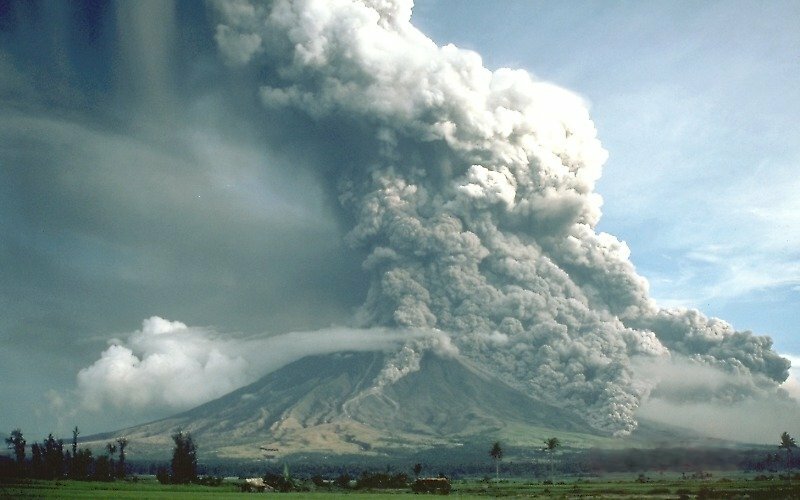 During the 1991 eruption of Mount Pinatubo, in the Philippines, ash was ejected to heights of 34km and pyroclastic flows completely destroyed the surrounding area. A volcano in Iceland erupted in 2010 and caused major problems for travellers throughout the world. The volcano produced a huge ash cloud that spread to the east. Many airports in Europe were closed for days because it was too dangerous for planes to fly through the ash. There are no live volcanoes in the UK but there remains evidence of the country's volcanic past. Edinburgh was built on an extinct volcano called Arthur's Seat, and volcanic rocks can be found all over Britain.